Swami Muktananda, Meditate: Happiness Lies Within You (South Fallsburg, NY: SYDA Foundation, 1999) p. 30. This evening when I visited the website, I was feeling tired. I took a few deep breaths and focused on my breath. I took out my journal and wrote down Baba’s teaching. As I wrote, I felt very calm and quiet. My breath became calm and balanced. It lit up my face. All my tiredness, lethargy, and agitation of mind vanished. I felt only love and calmness of mind. When I finished writing, my mind was saturated with Baba ji’s words. Thank you, Baba ji. Thank you, Gurumayi ji. 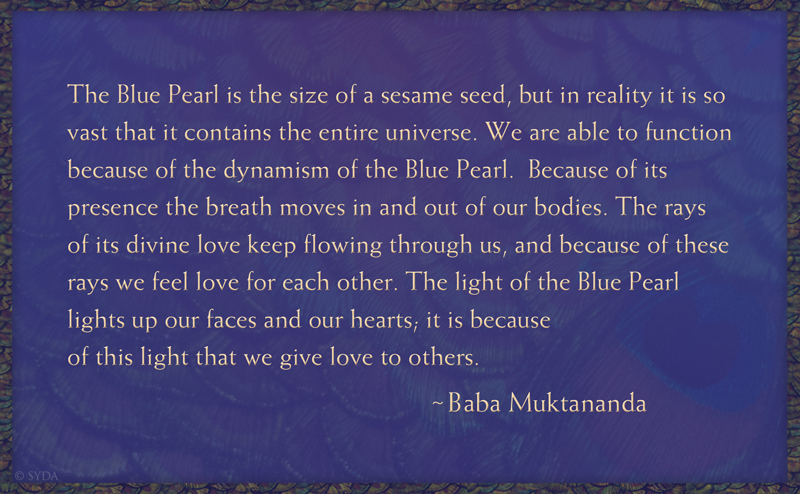 I just read Baba’s explanation of the Blue Pearl, which I had never heard before. And, for the first time, I perceive what it truly represents. I am excited to contemplate this new understanding. The Siddha Yoga path is full of unending jewels. Thank you, Gurumayi, for the nurturing knowledge in the Siddha Yoga path website. I feel like I am hearing Baba’s words for the first time, even though I have heard them many times before. I will study and assimilate these words, so that I can realize that I am That, Consciousness, I am love. I am so grateful for the Siddha Yoga path and the great Gurus of this divine path! Nearly thirty years ago, when I was living alone in a house in Bali, I saw a picture in the house that I discovered later was of Baba Muktananda. I was inspired to start meditating every day, and in each session I saw a scintillating blue light in my third eye region. Upon my return from Bali, I began to attend satsang at the Siddha Yoga Ashram in Oakland. The inner Blue Pearl has been a profound inspiration in my sadhana.